Do Ecigs and Vaping Cause Popcorn Lung? This is an important article for all vapers to read from top to bottom. Your health is nothing to play with, but some organizations seem to think it's a game. They deliberately are putting out misinformation for who knows what reason (wink wink). We'll get into that a little later in the article, but for now, let me lay the ground work. Popcorn Lung is slang for Bronchiolitis Obliterans, which is the scarring of the lungs. The scarring is on the small air sacs which narrows the air passages, making it harder for your lungs to oxygenate your body. This is a nasty disease and it's definitely not something you want to come down with. It is a progressive disease, which means it keeps getting worse and worse. Once you have it, you're pretty much screwed. Your airflow will become more and more obstructed, making it harder to breathe. Eventually, you'll need an oxygen tank and will have a very restrictive lifestyle. Ultimately and unfortunately, this disease is fatal. This rare disease is a tough one to catch in its early phase. The symptoms can easily be mistaken for other ailments or fatigue. The interesting thing about bronchiolitis obliterans is that it is very uncommon among regular people. In this case, regular means people who don't have extenuating circumstances. The biggest correlation to something that may cause bronchiolitis obliterans is lung transplants. 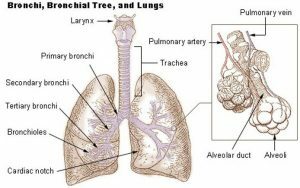 About 10% of bone marrow patients and 75% of lung transplant patients come down with bronchiolitis obliterans within ten years of their transplant (nih.gov). These two groups of people account for the majority of reported bronchiolitis obliterans cases. This is probably not the answer you were looking for, but it's the truth. You may have read about a different alleged cause on some fake news propaganda site on the internet. Be careful with these sites because we don't know who is behind them or what their motive is. It's so easy to spread opinions on the internet and pass them off as facts. According to the National Institute of Health, lung transplants are the single largest risk factor to coming down with bronchiolitis obliterans. Back in the year 2000, several workers were diagnosed with popcorn lung. They worked in a microwave popcorn plant in Jasper, Missouri. In 2007, seven workers were diagnosed with popcorn lung in California. These two cases are a large part of why people began to suspect diacetyl could be the cause of bronchiolitis obliterans. The sad thing is, people will go to a website they think they can trust and will get a ton of misinformation. This article on the American Lung Association's website claims, “we know that diacetyl causes popcorn lung.” How do they know that? Where is the source of this information. This bold claim they are making does not cite a source but it scares tons of people. To boldly state that you know, not think but know, is a heavy statement. In true science, it is terribly hard to prove causation. If the burden of proof is met, then saying you know something is fine. In the case of popcorn lung, nobody, not even the CDC knows what causes it. Given the circumstances that the workers were under, they think diacetyl could have been the culprit. Since they think it could have been the cause, they have taken precautionary measures so that the workers are not exposed to pure concentrated diacetyl anymore. That is the honest truth. Don't believe the biased misinformation on the internet. I won't go as far as calling it popcorn lung vaping propaganda, but I can't fault people for drawing that conclusion. Here's a study that is on the National Institute of Health's website that explored the amount of diacetyl in 51 e-cigs. 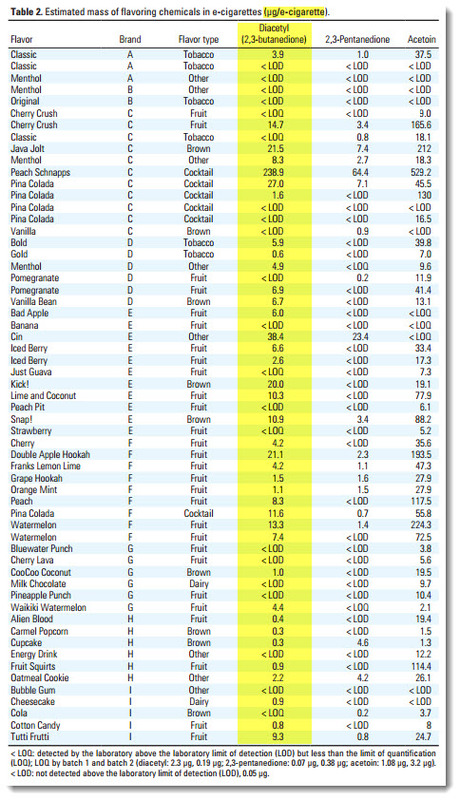 What I immediately noticed was that only one flavor out of the 51 in this study is above 39 micrograms per e-cig. Even with that flavor included, the average amount of diacetyl in an e-cig with diacetyl was 13.9 micrograms per e-cig. Oh no! That's crazy! I guess all these organizations are looking out for you and don't want you to breathe in diacetyl and rather you smoke cigarettes. They must really have your best interest at heart. How kind of them. But…I wonder if traditional cigarettes have diacetyl in them. Let's take a look. Here's a study that has been published in the Environmental Toxicology journal. You can read it at the Wiley Online Library. They tested 15 of the most popular brands of traditional cigarettes. Out of the 15 major brands they tested, the lowest amount of diacetyl was 301 micrograms per cigarette. Remember, the highest amount of diacetyl out of the 51 e-cigarettes was 238.9 micrograms per e-cig. The next closest was 38.4 micrograms per e-cig. That alone should be enough information for you to draw your own conclusion about which one would put you more at risk for popcorn lung, assuming that diacetyl could cause it. The average amount of diacetyl in the 15 major cigarette brands was 335.93 micrograms per cigarette compared to 13.9 micrograms per e-cig. But we're not done yet! An e-cig will last anywhere from a half of a day up to a whole day, depending on how heavy of a smoker the user was. 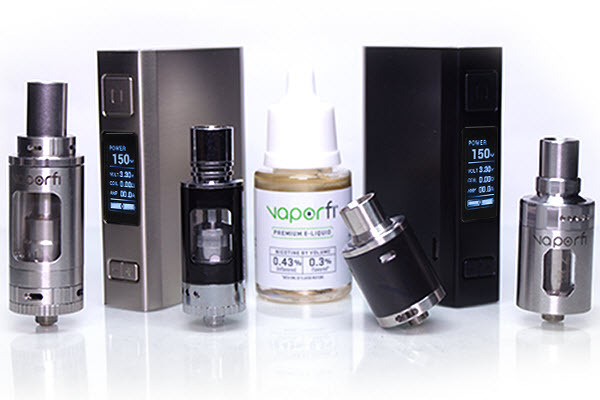 Let's say the user was a heavy smoker and plows through two e-cigs every day. That person would be exposed to 27.8 micrograms of diacetyl every day. 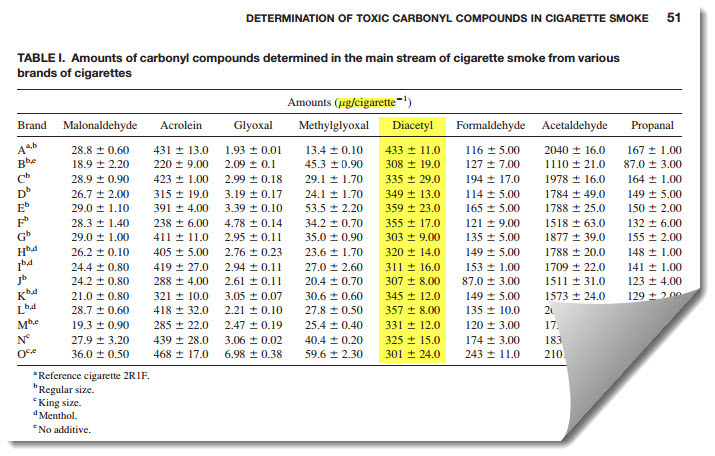 One cigarette has way more diacetyl than four e-cigs. Since we used a heavy smoker for the e-cig user, it's only fair to use a pack-a-day smoker for the hypothetical cigarette user. Let's say our cigarette smoker smokes 20 cigarettes per day at an average of 335.93 micrograms of diacetyl per cigarette. Our cigarette smoker would be exposed to 6,718.6 micrograms of diacetyl per day. That's 241x more diacetyl than the heavy e-cig user would be exposed to! Not to mention all of the other chemicals in cigarettes. But let's not even go there in this article. This article is about diacetyl. There is one thing that I need to make clear here. Not every vape juice or e-cig has diacetyl in them. 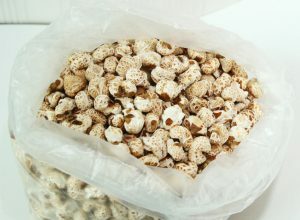 A lot of the major brands have actually removed it from their formula since the association with popcorn lung has been brought to their attention. The average of 13.9 micrograms is the average out of the e-cigs that had diacetyl in them from the study. Only 38 out of 51 e-cigs had diacetyl in them. The cigarette study was much different. All the cigarettes had diacetyl in them. Another thing I thought was interesting is that there have been no reported cases of popcorn lung that were linked to cigarette usage. Since a cigarette smoker inhales several hundred times more diacetyl than a similar usage e-cig user, it's interesting that no media outlets are saying cigarettes cause popcorn lung. Very interesting to say the least. What?! 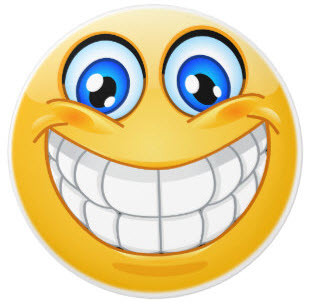 I did not tell you to laugh at someone when they tell you that diacetyl in e-cigs is causing popcorn lung! All I did was give you the information that I pulled from two legitimate studies posted in a reputable journal and a government health website. I'm not drawing any conclusions for you because I'm not a doctor or any type of medical professional. My conclusion is, you should consult with your physician before engaging in any risky behaviors such as smoking e-cigs, even though they probably won't know any of this information.